In this second installment of our series on butterflies, our Nature Guide Jon Latimer describes butterflies you may see around the property now. 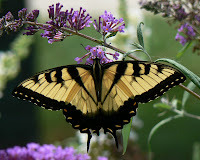 "The Eastern Tiger Swallowtail (from 4 to 5.5 in.) is one of the easiest butterflies to recognize in our area. Males are yellow with black markings that resemble tiger stripes. Some females are similarly colored, but others are dark brown or gray with black markings, yellow spots on the trailing edges of their wings, and blue spots on their tail. Adult swallowtails feed mainly on nectar from cherry, magnolia or tulip trees. They are most active during the middle of the day and frequently rest with their wings fully spread. "The Painted Lady (2 in.) is orange and black with bright white spots on the upper corner of each wing. Painted Ladies are found throughout most of the world, but are rarely seen in large numbers. Adults feed on flower nectar of many plants. "The Clouded Sulphur (2 in.) is bright, clear lemon yellow with solid black edging. The very similar Orange Sulphur (2 in.) has an orange overlay on the top side of its yellow wings. Both can be seen in open areas, especially on lawns, in meadows or along the edges of roads. They feed on nectar from many kinds of flowers, including dandelions, milkweeds, goldenrods and asters. "The smaller Pearl Crescent (1.5 in.) is mottled orange and brown. It is often seen flying low to the ground in open areas and sometimes gathers in groups near puddles. Adults feed on nectar from a great variety of flowers." Stay tuned for Jon's report on the butterflies of summer.